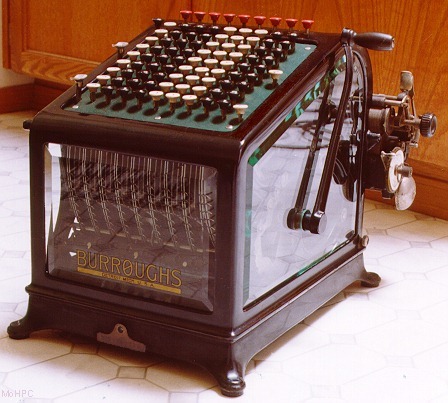 This Burroughs Class 1 was one of the most spectacular adding machines made. It was quite imposing at 19" deep, over a foot tall and more than 63lbs. It had beveled glass walls on 3 sides allowing viewing of the rocking segment mechanism. (The segments and key stops are seen clearly in the front window.) The printing mechanism was "blind" meaning the user couldn't see numbers as printed because they were behind the large machine. However, there was also a numeric register at the front of the machine just above the Burroughs logo. The printer had a wide carriage with a paper length setting and an end of page bell.